You might see these errors if there was an operating system error or you're running low on disk space. Here are some things you can try to fix the problem. We’ve listed the most common solutions first, so try them in order. For Windows 10, go to Free up drive space in Windows 10. For Windows 8/8.1 and Windows 7, go to Tips to free up drive space on your PC. Follow the steps in the Update your computer article. For more information about the system file checker tool, see Use the System File Checker tool to repair missing or corrupted system files. Select your operating system from below. Right-click Start, and then select Command Prompt (Admin). 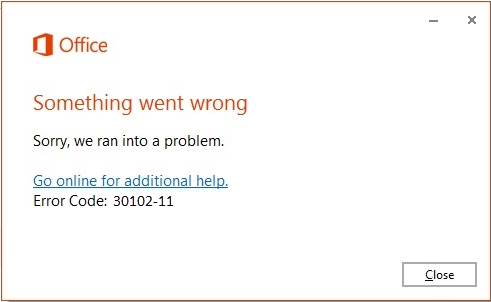 When the system scan is complete, try to install Office again. In the list of results, swipe down or right-click Command Prompt, and then tap or click Run as administrator. In the Administrator: Command Prompt window, type the following command and press Enter. Click Start > All Programs > Accessories, and then right-click Command Prompt and select Run as administrator. Select the Start button (lower-left corner), and then select Settings. Under Reset this PC, select Get started. Choose the option Keep my files, and follow the instructions on the screen. Follow the steps in the How to refresh, reset, or restore your PC article. Follow the steps in the How to Perform an In-Place Upgrade on Windows Vista, Windows 7, Windows Server 2008 & Windows Server 2008 R2 article.